Claudia and Isa from the popular blog Hauptstadtmutti are like sisters, when you’re in a room together with them you can feel their closeness and loyalty. Their characters seem aligned, despite their entirely different personalities. They call themselves an old couple, which is one of the biggest compliments for a friendship as it shows the respect and appreciation for each other, at least in their case! The mutual understanding also comes from the fact that the two women live similar lives, they are young, working mothers, they share similar interests and daily issues but also a big passion for fashion! Claudia and Isa only met five years ago and made a big step together, the energetic art director and journalist brought their different qualities together and merged them into their daily blog Hauptstadtmutti (meaning mother of the capitol in German). It soon became a vivid space for Berlin’s mothers, their individual style and creative personalities. Pure elegance meets cool effortlessness and eclectic practicality, these mothers defy conventions and break with expectations. Clicking through the blog’s street style portraits is an inspiration for any woman! 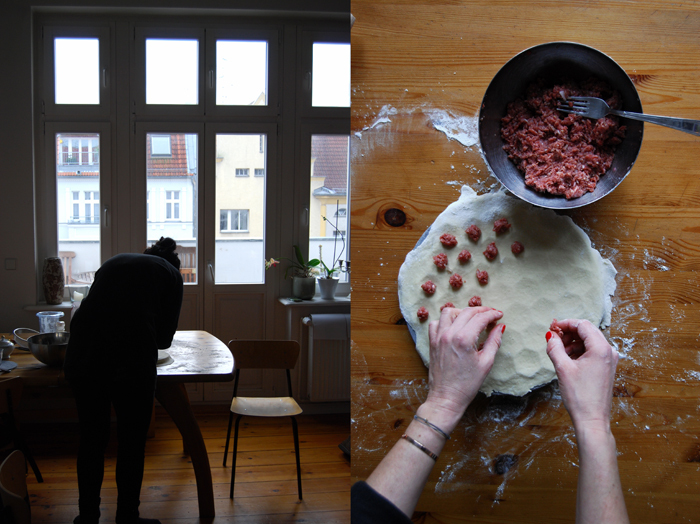 We planned to have a joint cooking session in one of their culinary spaces, but as both of them are so fascinating and their lives and personalities offer so much to talk about, we decided to split the Hauptstadtmutti kitchen series into two parts. So today, we’ll start off with part I, in Claudia’s cosy old rooftop flat where she lives with her 5 year old son, a true gentleman who welcomed me with a handshake. Claudia’s mother is from the Ukraine which brought an Eastern European influence to the family’s cooking. I’m not very familiar with the country’s cuisine so I was very happy when she offered to cook one of the most popular traditional specialities for me. 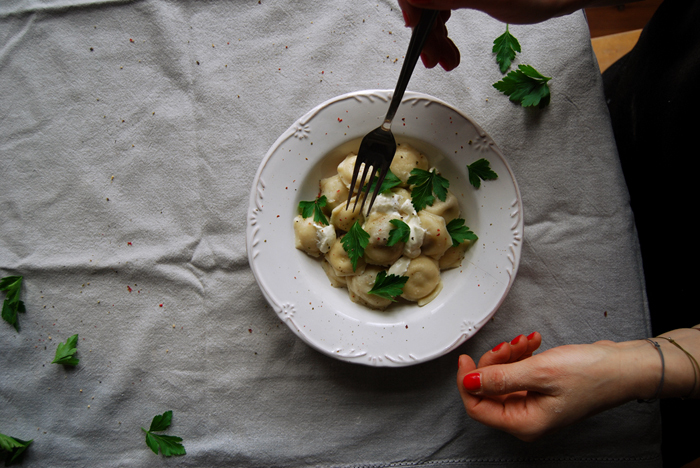 Claudia shared her old family recipe for little meat filled dumplings called pelmeni with me which are traditionally served with crème fraîche, white wine vinegar, mustard and parsley. 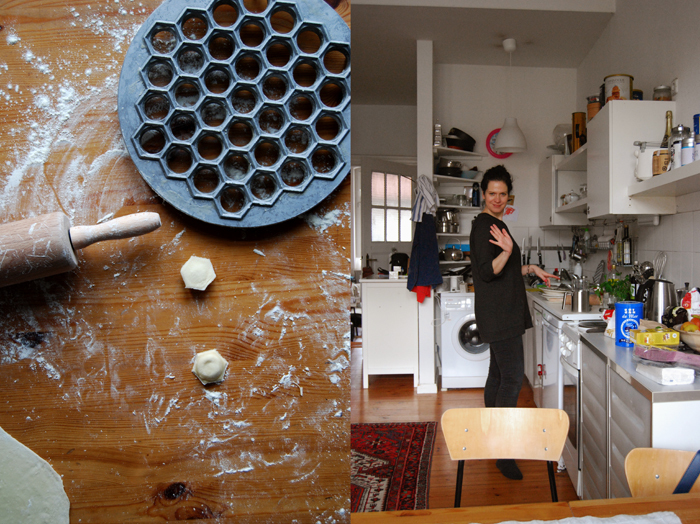 She uses a beautiful utensil for the preparation which looks a bit like honeycombs made of iron. 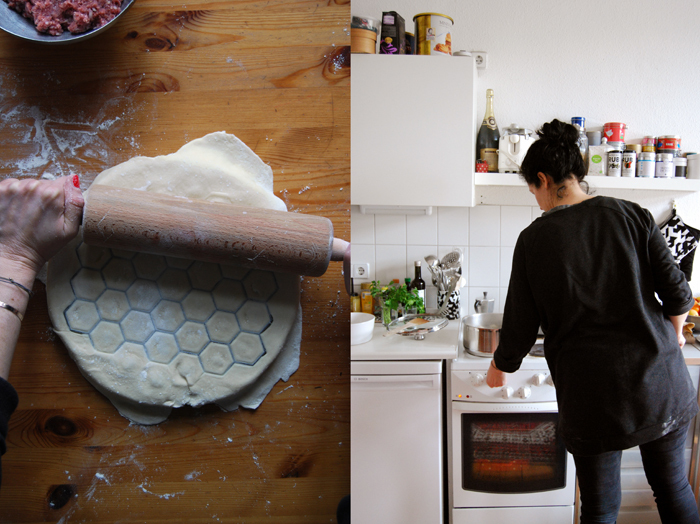 For the dumpling preparation, she covered this pelmeni maker with a thin layer of pastry, filled each comb with a little ball of spiced minced meat and put another pastry layer on top before she gently rolled over it with a rolling pin. 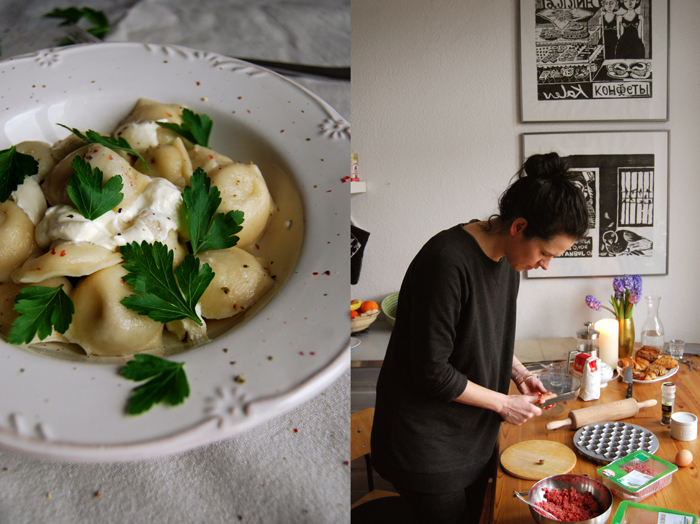 Within seconds, the dumplings were closed and cut into perfectly shaped pelmenis! 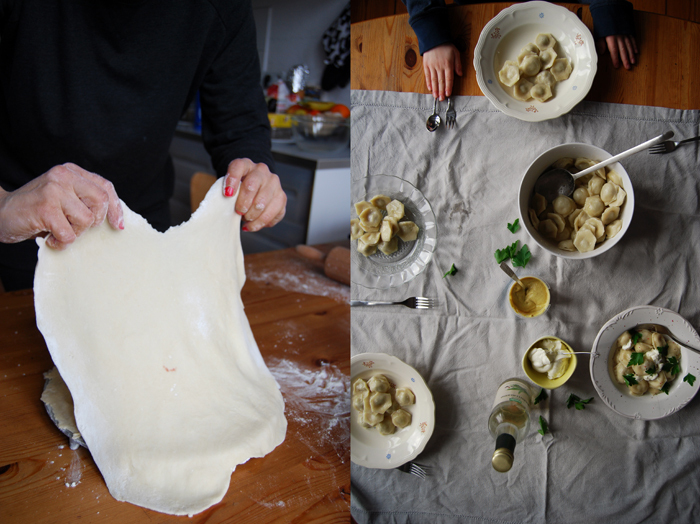 When I saw Claudia pushing the dumplings out of the frame with her fingers I understood why her little son loves to cook this dish together with her, this is fun! As much as I enjoyed the preparation, savoring this meal was a delight. There’s no doubt why this is her son’s favorite meal, it’s delicious, honest comfort food. 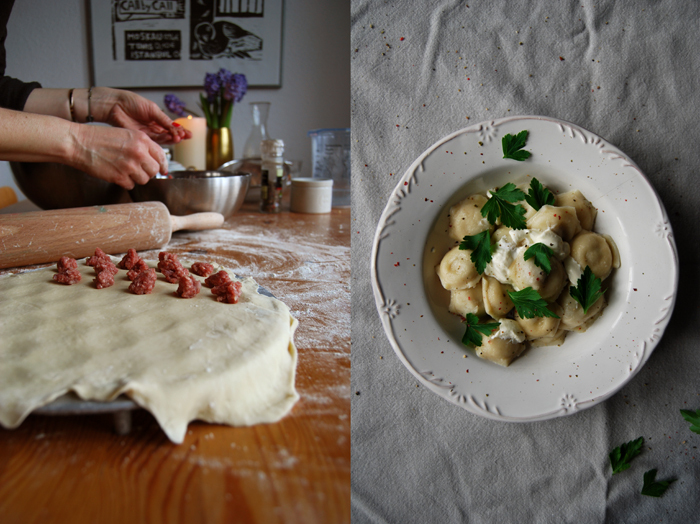 Claudia said that the older generation in the Ukraine still shapes the dumplings with their fingers, the traditional way, without the iron pelmeni maker. 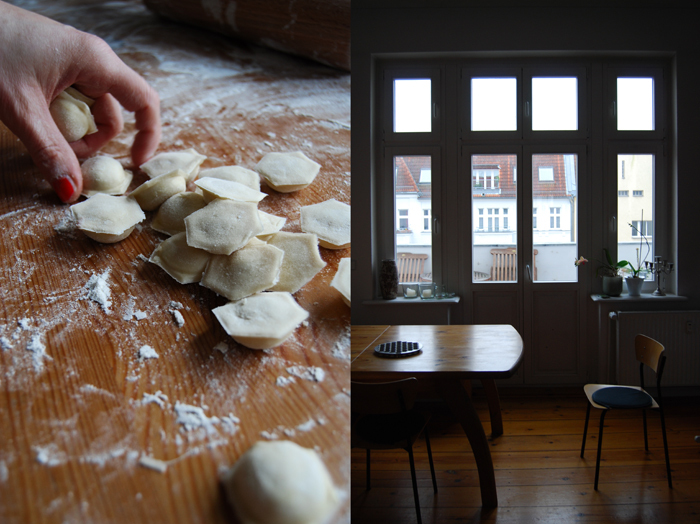 I can just see the families standing around a wooden table in the warm kitchen, rolling out dough and filling the pelmenis, like we did on a cold January day in Berlin! 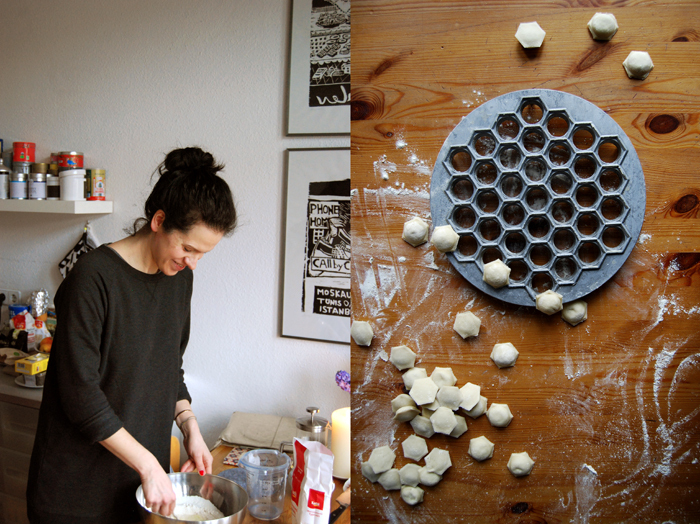 Soon I’ll meet Isa in her kitchen for the second part of our Hauptstadtmutti cooking series – to be continued! Put the flour in a large bowl and form a well in the middle. Add the salt, water and egg, mix with a fork and slowly stir in the flour from the sides. Knead well with your hands to a firm dough, add more flour if necessary. You should be able to tear the dough when it’s done. Let it rest while you prepare the filling. Mix the ingredients for the filling and shape little meat balls (thumbnail sized). Bring the broth to the boil. Take a handful of the dough and roll it out very thinly on a well floured surface. 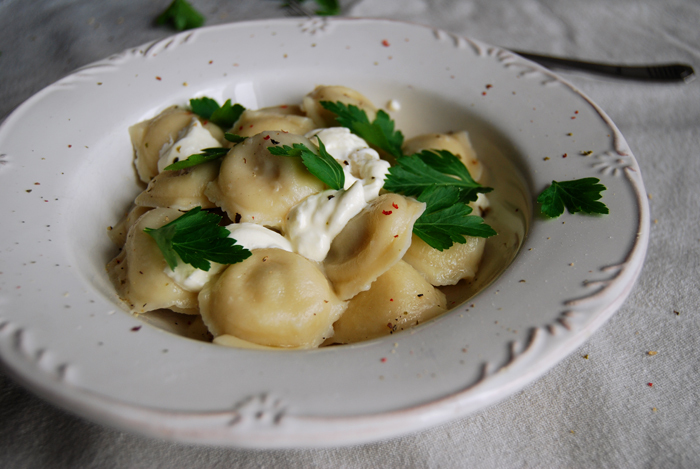 If you have a pelmeni maker, cover it with a layer of dough and fill each comb with a little meat ball. Close it with another thin dough layer and gently roll over it with a rolling pin to seal the dumplings and push them through the wholes. If you want to shape the dumplings by hand, lay the thinly rolled dough on the working surface, spread the meat balls evenly, cover with another layer of dough and cut small squares or circles with a knife or a pizza cutter. Seal each dumpling well by pushing the rim together. Gently add the dumplings (in batches) to the hot broth and cook on medium-low heat (simmering) for about 7 minutes. Take them out with a slotted ladle and mix the pelmenis with the melted butter. Serve the dumplings with a spoonful of mustard and crème fraîche and sprinkle with pepper, vinegar and parsley. 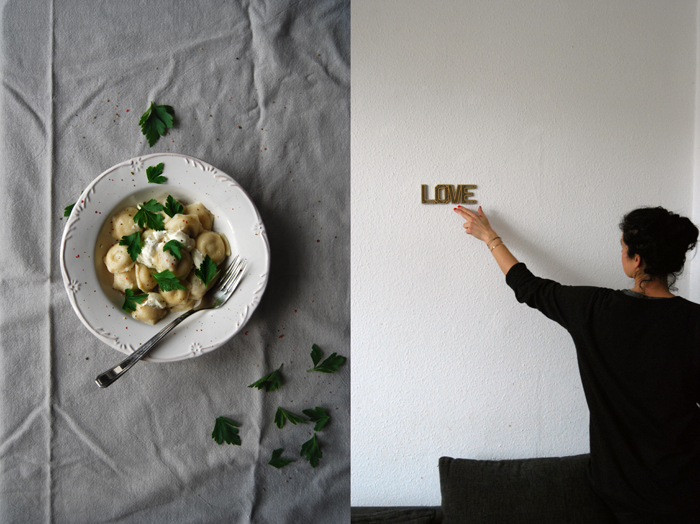 How would you describe the Berlin mothers you feature on your blog Hauptstadtmutti? What fascinates you about them? Berlin’s mothers are diverse, their style is individual and independent. We love all of them because each single one is special in their own way, and that’s her own charisma. We’ve been taking pictures for our Mama-Streetstyle series for 4 years and we never get tired. The nice thing is that we also get into conversations with them, we have a little interview and get to know some of their secrets, desires and thoughts. What role does fashion play in your own life? A mother’s life is very much determined by practicality, is it possible at all to keep her style and fashion uncompromised? Fashion occupies and surrounds me. I just enjoy seeing trends and developments evolve, and how they are translated in different cities. My main focus is on mother’s fashion as there is still a high degree of practicality involved which shouldn’t be underrated. My own shopping and styling has sped up considerably. I don’t have the time to shop for hours anymore, that’s why I’m very happy that I can buy and discover so much online. Exhibitions, theater and movies, interviews, great people, long chats at the table with friends, traveling the world, the internet and long walks through the city. How did your cooking change since you became a mother? Can you give any tips for cooking with and for young children? I try to cook with more time, and good ingredients since my son was born. I set the table nicely, as you eat with your eyes first. My advice to parents is to let your kids eat what is on the table, no extra dishes. And conversation at the table is important, to ask about each other’s day, and to eat together with many people, that’s fun and social. Children tend to eat better in company. You’ve lived in Prague and Kiev, your family roots are Ukrainian, Russian and East-German, how would you describe the Eastern European cuisine you grew up with and the cooking you experienced while you lived in the Czech Republic and the Ukraine? Eastern European cooking is primarily heavy! It has to satisfy the appetite. The Ukrainian cuisine also relies on fish and vegetables which I love a lot. The recipes are often very easy to prepare, and in the end, the table is full of lots of different dishes, not just one plate with one meal, which I find boring anyway. All Eastern European meals are connected with long conversations at the table and, of course, lots of alcohol. My grandmother in the Ukraine would feel ashamed to put just one dish on the table. That’s why we spend days in the kitchen cooking for festive events and family feasts. She asks me all the time what I cook for my son and if he eats properly, she’s convinced that I don’t give him the right food. This is what I associate with my time in Prague: many young, committed chefs who traveled the whole world before they came back home, new restaurants opening with the most exquisite, modern Czech kitchen. Great! Always surprising! Apart from that, I remember the delicious apricot dumplings by my friend Andrea’s grandmother, with lots of sour cream, to die for! What was the first dish you cooked on your own, what is your first cooking memory? A soup made of grass, soil and water in a little doll’s cooking pot in my grandmother’s garden in the Ukraine. My dolls loved it, with fresh apricots for dessert! 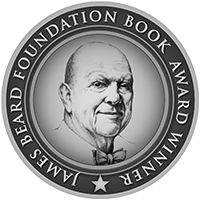 Who influenced and inspired your culinary style the most? My grandmother in the Ukraine, but I also like to get inspired by my friends who cook for me. Turkish markets for fruits and vegetables, the Russian supermarket Stolitschnaja on Landsberger Allee in Berlin for Russian products. 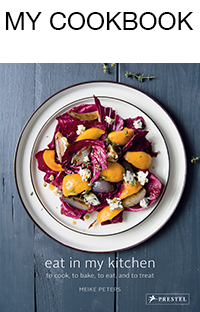 What did you choose to share on eat in my kitchen? You, Meike, and some fish! Wareniki (dumplings with cherries and sour cream) by my Ukrainian grandmother, today it’s all kinds of variations of fish and aubergine. It depends on my mood and the guest. A Jamie Oliver recipe with meat, I forgot which one it was ….